Have you always wanted to buy your favorite makeup products while scrolling through your IG feed? Well, now you can! Shopping is now easier than ever with the new Instagram Checkout feature that allows you to purchase from brands you love without leaving the app. The platform introduced Checkout on Instagram last week. Users can simply tap to view a product from a brand’s shopping post, then click on the “Checkout on Instagram”. Next, users can select various options such as color or size and proceed to payment without leaving the app. Instagram makes shopping easy, as it only requires users to enter name, email, billing information and shipping address once. Users are able to purchase products using Visa, Discover, MasterCard, American Express and PayPal. After completing the first order, Instagram will securely save user information in one place, so you can continue to shop your favorite brands without needing to log in and enter information several times. This means you’ll never have have to fret about finding your card or grabbing your wallet from across the room, and no longer will you have to navigate to the browser when you want to buy. Instagram will also send you notifications about shipment and delivery from inside the app, so you can easily keep track of your purchase. “Checkout is just one part of our long-term investment in shopping. 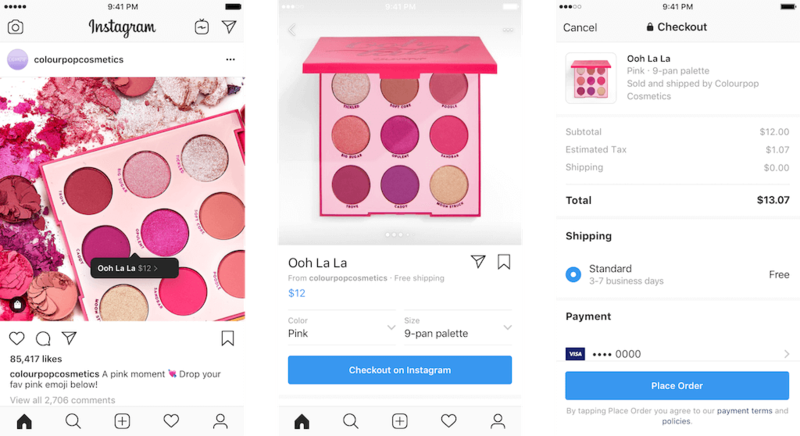 We’re excited to introduce even more ways for people to enjoy shopping on Instagram this year,” said Instagram in a blog post. The feature is currently in closed beta for businesses and only available to US users. A handful of beauty brands were selected to be a part of the initial rollout, including ColourPop, Huda Beauty, Kylie Cosmetics, M.A.C., NYX, and Ouai Hair. The full list of fashion and beauty brands below will begin rolling out over the coming weeks, and Instagram promises even more soon to come.